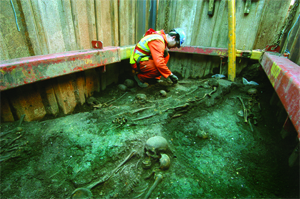 Excavations in Liverpool Street have revealed a post-Medieval cemetery. Could it contain the dead of the world’s first lunatic asylum? Jay Carver and Nicholas Elsden spoke to Matthew Symonds. In 1247 Simon Fitz-Mary, an Alderman and Sheriff of London, financed a new priory on the outskirts of the city. The site he selected lay just beyond the London wall at Bishopsgate, on the edge of the great Moorgate Marsh. Dedicated to St Mary of Bethlehem, Fitz-Mary’s gift was intended to provide a place of prayer and piety for the Order. Instead, it would become a byword for meting out brutal and degrading treatment in the name of healthcare. First described as a hospice in 1329, the institution took a hesitant step towards the specialism that would make it infamous before the end of that century. This involved admitting mentally ill patients, or ‘men deprived of reason’ as they were condemned in a contemporary report. After the religious house was dissolved by Henry VIII in 1547, St Bethlehem was refounded as a Royal hospital, and entrusted to the City of London. An inspection in 1598 revealed endemic squalor and neglect. The buildings were decaying unchecked, drains were backing up, and the Great Vault — or cess pit — was in danger of overflowing. The patients were not faring any better: restraint was provided by iron manacles and chains, while treatment amounted to little more than buckets of water and the lash. The howls that administering such care provoked were described by one witness as ‘so hideous, so great; that they are more able to drive a man that hath his wits rather out of them’. The institution’s reputation spread quickly and it was known by many names in the Medieval period, including ‘Bethlem’ and the word that would come to express its worst excesses: ‘Bedlam’. Such notoriety established the hospital as an early metropolitan tourist attraction, with Londoners flocking to pay a penny to witness the harrowing spectacles of the asylum. Now construction of a new ticket hall at Liverpool Street Station as part of the Crossrail project is bringing about the excavation of part of the former St Bethlehem burial ground, undertaken by Museum of London Archaeology (MOLA). Hundreds of skeletons have been discovered, interred under the Liverpool Street tarmac. These have excited considerable interest, with the remains being widely reported as those of the unfortunate inmates of the world’s first lunatic asylum. Yet the truth is less clear cut. Who was really buried in this cemetery, and what can they tell us about an age when it was a jolly distraction to laugh and gawp at the capers of ‘men deprived of reason’? London’s ever increasing population had brought the parish graveyards within the city walls to crisis point. Chronically overcrowded, coffins were stacked like subterranean high-rises in ever deepening shafts, as the dead were packed in one on top of the other. Requisitioning St Bethlehem’s vegetable plot was an essential element of a scheme to relieve the city centre graveyards, and provide new space for London’s, not the asylum’s, dead. Once established, the extent to which patients were interred in the cemetery is still unclear. Yet, in the early years at least, there is every reason to believe that it was far from routine. People came to St Bethlehem for treatment from all over the country, and it appears that when they died, efforts were made to return the bodies to their home parish. Yet such a need was, in itself, comparatively rare. For all its barbaric and alien methods, St Bethlehem was very like a modern hospital in one key regard: people were not sent there to be incarcerated in perpetuity — the intention was to treat them, then discharge them. Study of the St Bethlehem skeletons is still ongoing, but the initial results provide a vivid insight into the realities of life in the burgeoning capital. Closed around the mid-18th century, the burial ground became every bit as choked as the city cemeteries it was intended to relieve. Bodies, either in coffins or the cheaper alternative of shrouds, ended up pressed on top of each other, to a thickness of over 2m in places. Both the density and depth of burials, though, have been found to vary across the site. The greatest concentration of bodies from the current excavations fits closely with what was discovered during work on another part of the cemetery in the 1980s, when the nearby Broadgate centre was constructed. The cemetery contains a range of age groups from infants to adult. A tentative indication that there may have been some kind of zoning came from a concentration of juveniles in one trench. Most of the dead were not accompanied to the grave by any durable items other than coffin nails, and the copper pins that held their shrouds in place. 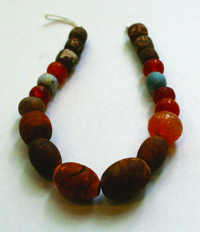 One poignant exception, however, was a vibrant painted bone and coloured glass necklace still worn by an infant of under three years. Traces of illness and injury visible in the skeletal material are fairly representative of what is known of the London population during this period. Rickets, visible as a deformed bowing of the leg bones, was all too common. Caused by a shortage of vitamin D or calcium during childhood, several of those buried in the St Bethlehem graveyard survived into adult life with the condition. Still a major problem in developing countries, rickets is particularly tragic as the natural urge to swaddle the sick in warm clothes and shelter them indoors only worsens the condition. Badly needed vitamin D would be naturally manufactured simply by exposing sufferers to sunlight. A number of other diseases were sufficiently acute to make a lasting impact on the skeletal material. One otherwise healthy male was killed by aggressive cancer. A handful of cases of syphilis have also been detected in the cemetery. Most commonly visible as an inflammation of the lower leg bone or tibia, the precise number of sufferers will only be confirmed following full study of the remains. A distinctive greenish tinge, found on the forehead of a number of skulls, was a post-mortem development caused by the slow corrosion of a copper pin fixed directly above it to secure the shroud. This is an extract. The full article can be found in Issue 257 of Current Archaeology, on sale now. Jay Carver (Project Archaeologist, Crossrail); Nicholas Elsden, Graham Kenlin, Sarah Matthews Don Walker, Michael Henderson, Amy Thorp (MOLA). CA is grateful for their generosity in sharing the results of their work and expertise. 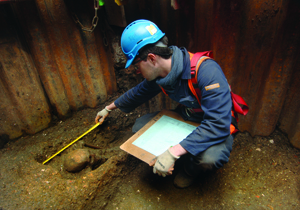 CA would like to thank Crossrail and Museum of London Archaeology. Seewww.crossrail.co.uk/archaeologyfor more Crossrail news.